Ful medames is a very popular ancient Egyptian meal that's made from fava beans and can be topped with your favorite version of fried eggs. A more tradtional way of making this fava bean dish involves soaking dried fava beans overnight before creating your fava bean recipes. Dried fava beans can be found at Middle Eastern and at ethnic grocery stores. They also go by the name broad beans. Soaking dried fava beans is a way to alleviate much of the problems associated with gas or indigestion when eating beans. Take the time to soak your dried fava beans before preparing your Middle Eastern ful medames recipes and your stomach will thank you! Soaking beans removes anti-nutrients such as phytic acid and trypsin inhibitors. Thus, your body will receive more nutrition from eating soaked beans. Soaking beans will also minimize gas formation in your body and minimizes cooking times. And soaking helps to clean the dirt and other residue found on beans. Add oil to a skillet and heat pan to med-high heat. Saute onions and hot pepper with a pinch of salt - until translucent. Then add the garlic and saute until golden brown in color. Lower the heat and stir in the fresh tomatoes - cover with a lid and simmer for 4 minutes. Remove lid, turn up heat and stir tomatoes for 2 minutes. Next add in the fava beans and let boil together before adding in the lemon juice and seasonings. Cover with lid and cook on a low heat for 4 minutes. Transfer to serving bowls and top with chopped parsley and olive oil. Sort beans and discard any old looking beans. Rinse beans once or twice. Soak beans with enough room temperature filtered water to cover the beans by a few inches (beans will expand during soaking). Soak beans for at least 6 to 8 hours or overnight. You should discard the soaking water as the soaking water may cause gas in some people. Now your ready to cook your beans. 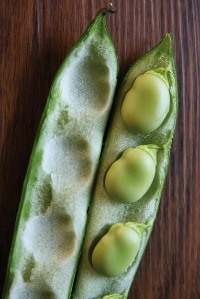 This is what fresh fava beans look like when their still in their pod. And if your feeling really ambitious, you could use fresh fava beans in your recipes instead of dried fava beans. 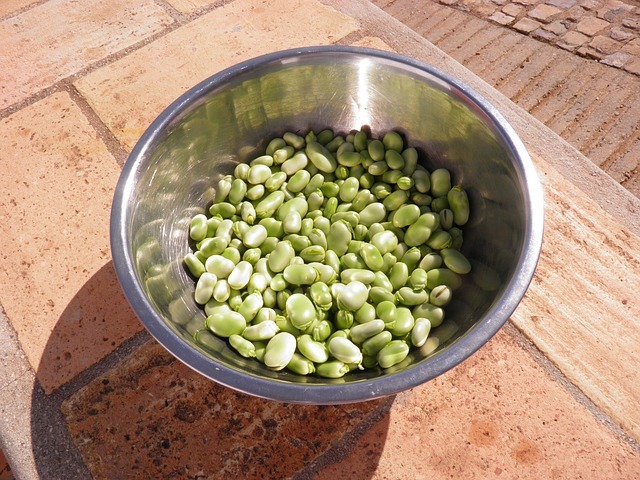 You would have to learn how to properly prepare fresh fava beans and learn how to shell fava beans. You could also soak the fava beans overnight and squeeze the beans between your fingers to shell the fava beans before cooking them. Drain the soaked beans and place in a crockpot. Add garlic and 7 cups of filtered water to crockpot. When beans are soft turn off crockpot and transfer beans to a bowl. Add lemon juice, olive oil, sea salt and mash slightly. Garnish with parsley, a drizzle of olive oil, and your choice of egg preparation.